#7368 3’ ClearPack shock-absorbing lanyard with integral alloy-steel self-tracking rope grab. Also includes our #7410 hinged, re-usable roof anchor and comes packed in a 5 gallon bucket for storage. tongue-buckle leg-staps and five-point adjustability. finished with steel thimbles and PVC shrink tubing to protect the splices. 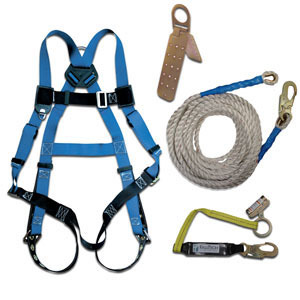 •#7368 Lanyard with integral alloy steel, self-tracking grab limits arrest forces to 900 lbs or less. •#7410 Hinged, re-usable anchor can be mounted with 12 #14 x 3½” screws or 20 16d nails.